Package includes flat deflated Elf hat and 4 rings. 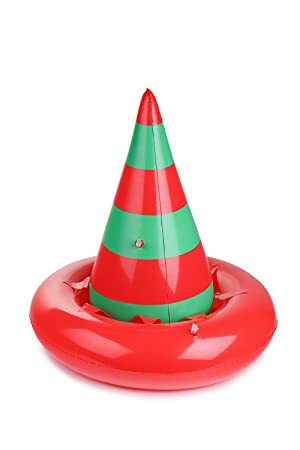 Measurement - (After inflating)Elf Hat:approx.20"*24".Ring Toss:10" in diameter. 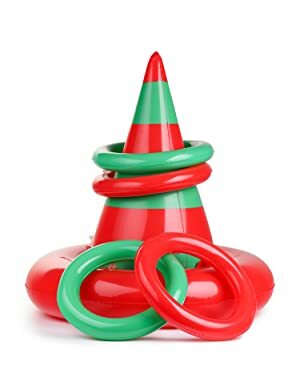 Easy to play - Easy to inflate and deflate Elf Hat and Rings. Players take turn tossing the rings at the Elf Hat. The player who gets the most rings around the hat wins a prize! 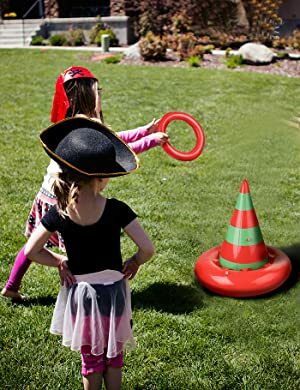 Enjoy this inflatable ring toss game for you holiday party.Perfect for indoor or outdoor use!It is great fun around Christmas to play with for the entire family. NOTE:The hat has a flat bottom.You can not wear it.Just put it on the flat space or hold it with both hands to keep it from falling off of your head. Elf hat have 2 inflation.Overfilled hats will pop. Fill slowly. Easy to inflate and deflate. 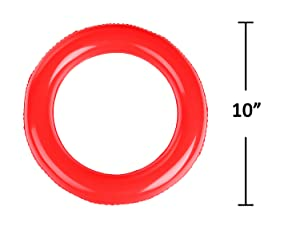 Package includes 4 rings.Perfect size for you to take turn tossing the rings at the Elf Hat.